Nathan, R. (2005). My freshman year: What a professor learned by becoming a student. Ithaca: Cornell University Press. Scholarship application, relationships with others sharing information not used for book, concern for academic success when only taking two classes. Rebekah Nathan is a pseudonym used by a professor of anthropology and a large state university to become a student at her own university. In the spring of 2002 she applied and was admitted as an entering freshman. This book is an accounting, if you will, of her freshman year experience. Today we will be discussing the first half of the book. Nan will take us through the last half of the book later in the semester. 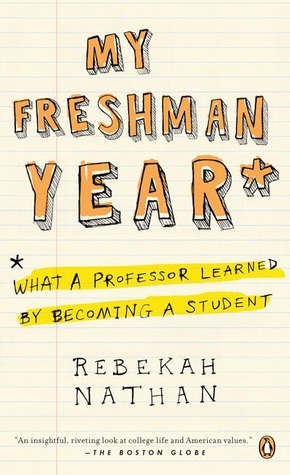 Ms. Nathan begins this chapter by reminding her readers that when analyzing both the college scene and the students who make up the landscape, that they must keep two things in mind: first, some of the characteristics seen on college campuses and in their students are centuries old; and second, not all college students buy into the standard of the day. In fact, American colleges have a culture that is “neither singular nor monolithic” (p. 107), and like that of any other culture, they are made up of alternative, counter, and subcultures. The next section will uncover four differing cultures that make up American college campuses today. A brief examination of some of the characteristics of said cultures will be discussed, and how one might recognize these on our campuses today. The categorization of cultures is neither precise nor meant to lump particular groups into respective camps. Although Ms. Nathan has placed certain groups into a particular cultural model, this does not mean that each group agrees with or adheres to all of the categories values. How can we recognize this culture on today’s campus? The Outsiders included “Jews, women, and later, people of color and immigrants” (p. 108). This alternative culture became a force on American campuses during the 1960s and 1970s and continues to be visible on campuses today. 1. Why is it important for educational leaders to understand the differing cultures on a campus? 2. Did you find yourself in one of the aforementioned groups? If so, which one, and why do you think you placed yourself in that group? Professor Nathan spoke about the many time management workshops that she attended during her first days as a student that encouraged students to keep a daily planner, not to waste precious time on leisurely activities, and to quit their jobs. However, she found that the key to time management was in essence the ability to manage college. This included shaping schedules, taming professors, limiting their workload, and cheating. Shaping schedules is the ability to choose the days and times one takes their classes, with whom they choose to take the class (with a difficult teacher or an easy teacher), and the ability of skillfully registering for classes that will give them more personal time. Taming professors is the ability to “get what you want from classes by establishing and using a personal relationship with your teachers” (p. 117). This can be done by befriending the professor, sitting in the right place in the classroom, or staying after class to talk with him or her about their weekend. Limiting Workload can simply be defined as doing what’s necessary to pass or “strategic corner-cutting” (p. 122). It is the amount of time and effort a student is willing to put into a particular class. Some students will ditch a class because they need that extra period of time for themselves. As long as they are passing the class, the students see nothing wrong with missing. If students perceived that they were not going to get anything out of a class period, they would ditch that class. Students normally start out reading every assignment, but then as they realize that this is not necessary, and because they want to spend more time on themselves, they do only what is necessary. Cheating is another way that students attempt to control their time by controlling their college. While “90 percent of college students reported seeing another student cheat in the previous year; the national average was 80 percent” (p. 125). 3. What have you found to be the most effective method of time management? 4. Have you ever attempted to manage your college with any of the aforementioned techniques? Explain. The main lesson that Professor Nathan learned during her study was compassion. During her year, she was surprised to find that although she was an excellent student in many of her courses, there were others in which she struggled. Even after using the tutoring services, and spending many hours trying to figure out the content of these courses, she felt more and more frustrated and had the desire not to go to class. She also was able to see how time plays a very important role in student behavior. Before her study, she would be upset if a student did not show up to her class, did not do the pre-class readings, or if she found a student sleeping while she was lecturing, but now she understood the time constraints in which today’s students are dealing. The second lesson she gained from her time as a student was that of student culture and liminality. Undergraduate culture “becomes this luminal communal space where students bond with one another, sometimes for life, and, amid rules of suspended normality and often hardship, explore their identities, wrestle with their parents’ world, and wonder about their future” (p. 147). Dr. Nathan found that during her year she made friends and connected with people in which, in normal life, she would have never had the chance to bond. It is through these experiences that the “the seeds of enormous creativity and … of wider social change” has the most potential (p. 147). 5. Have you ever felt angry and/or frustrated with students who are continually tardy to class, do not do their homework, and/or sleep during your class? 6. In our current areas of responsibility, how can we feel and demonstrate genuine compassion for our students or with those with whom we interact? 7. Have you ever had or observed a luminal experience? Explain. Professor Nathan was very concerned with the potential of ethical dangers throughout her study on her own campus. She used a pseudonym (Dr. Rebekah Nathan) and a fake university name ‘Any-University’ (AnyU) as a way to protect the university, herself, and those in whom she was studying. She also purposed to keep her identity hidden from those in whom she studied if at all possible. However, on several occasions, she was forced to reveal her true identity as her friendships with other students progressed, and as particular situations developed. The write up was another challenge because she wanted to protect the participants, and did not want these individuals to later read her work and feel betrayed. A few months after her research was completed, one of her ‘friends’ saw her on campus, and through their conversation, the truth about her true identity was shared. The student was shocked and said, “I feel fooled!” The researcher felt bad but explained the situation to the student who was seemingly satisfied. However, Dr. Nathan knows that she will have other uncomfortable encounters with people she met during her year as a student, and hopes that they will understand the purpose of her study. 8. Do you think it was a good idea for Professor Nathan to disclose her true identity? 9. What do you think about her doing the research on her own campus? A cultural anthropologist – professor at a university, female, in her 50s – realized that she no longer understood the students entering her university. Her formative theory base was to focus on the student population at her university. She did not wish, however, to conduct a study from the professor-student perspective. After much consideration and discussion with colleagues she enrolled at her university as an incoming first-time-freshmen (FTF) student. She debated about the ethical situations she would face in undertaking such a study. Here are a few of the issues she mentions: Can an anthropologist legitimately go “undercover”? How to deal with the Institutional Research Board? Would she be discovered? In terms of methodology: Would she be able to record her personal experiences or anything that was said to her for the findings since she did not disclose her identity. Rebekah Nathan, pseudonym, had spent most of her professional life living oversees studying a remote village studying a culture foreign to her. After more than 15 years of university teaching, students had become increasing confusing to her. She questioned why students never stopped by to see her during office hours; how students used class time to eat full meals; many did not take notes during lectures; students took naps during class. She audited two courses and saw how by simply “acting” like a student gave her an in with students. They no longer addressed her in the same manner as would be the case of the students knew she was a professor auditing a class. She mentions the work of Michael Moffatt, who conducted research at Rutgers University between 1977 and 1987 and wrote an ethnography about the experience. Rebekah hoped to bring a new light to this topic which included a woman’s point-of-view. She applied for admission in the spring of 2002. After being admitted, she received – as all freshmen did – and invitation to attend a two-day Preview session, an orientation to college. This was a great issue to consider. She discussed this issue with friends and colleagues to determine the best way to handle this. Scenario exploration, role-playing, and discussions were conducted. She would have to misrepresent the truth of who she is in order to conduct this study. In June 2002, she attended the Previews. Rebekah took great care in getting ready believing that her clothing would support her persona. She was wrong; she soon discovered that she was dressed like the parents of the incoming freshmen. She was mistaken for a parent when checking-in. Rebekah discovered the many activities and situations that a student encounters. Even though she worked at this university, where she was now pretending to be a FTF student, she did not know what the orientation day content consisted of and was surprised by some of the sessions. She moved into the dorm on a Saturday in August. She participated in many of the Welcome Week activities. She discusses her familiarity of the campus and compares that to her student point-of-view. She felt lost and a bit “clueless” culminating in an experience for her. Rebekah, over 21 years of age, decided to indulge in an alcoholic beverage in a common area and got busted. She realized that she was out of touch with the current lingo. Rebekah figured that since she was proving to be an outgoing personality that she was being accepted into the culture as any freshmen student would be. She was a participant-observer – while in an activity, she was not able to write many of the field notes. Rebekah notes that the dorms were built in the 1940s. Two people commonly shared a small space. The kitchen, bathroom, and lounge areas were communal style living arrangements. She noted the crowing in the bathroom early in the morning as everyone was trying to get ready to attend class. She kept careful records of the formal bulletin board displays, the pictures, the Resident Assistant’s door displays, and of how the outside door to a dorm room changed. Rebekah noted that some student doors were decorated elaborately while others more simply. Individuality and Freedom of Choice were constant these observed by Rebekah. Not all residents showed up for the meeting. Rebekah listened to the rules, spoken and unspoken, about dorm life. She noted the difference between the weeks before classes and compared it to the routine of class attendance. Her hall mates were like “ships that passed in the night.” Rebekah was overwhelmed at first – 15 unit course load. She noted statistics relevant to student study time. Rebekah noted that compared to Moffatt’s study, many students spent their hours outside of class and study time holding down a job and/or volunteering for community service. She noted that scheduled activities were different for different students. Her summation is that it is hard to create a community when the sheer number of options in college life generates a system in which no one is in the same place at the same time. There is little that is shared between students by virtue of attending the same university. It takes forethought and effort to overlap with others or to build a social circle. Despite the emphasis on community, there is no true opportunity to build it; it becomes both elusive and unreliable. Rebekah gives the example that when she returned to the dorms after completing the study; she could not find one person she recognized in her old corridor. She discusses her findings on students changing majors and students changing organizations or club memberships. She begins this chapter by describing one of the sessions she attended which took the students through their shared history. Rebekah noted that there is a Freshmen Colloquium that is required of FTF. She wrote that the faculty had an ambitious and, what they thought exciting, agenda. These faculty required readings over the summer. The author was invited to speak to the students and it was hoped that since all the FTF were required to read the book that this would be a great basis for discussion. For the administration, it was another way to foster community building and contribute to retention. She acknowledges that she was one of the last to take the course; it was nullified by the university because it did not work as hoped. The question: How can we give students a sense of community? Required common experiences are not popular. Rebekah again noted effort the university representatives took to attempt to engage the students. This included many notices inviting students to partake in activities. One example was that of her RA. The RA sent out a survey to determine what the residents wanted. The responses determined that a movie night was something that was wanted. The RA held a movie night, but only two people showed the first week and nobody showed the following time. Fewer than 10% of AnyU residents are members of fraternities and sororities. She found profound ambivalence about community life. She highlights the trends in dormitory living – higher in amenities and lower in density, no communal bathrooms, lounge, or washing machine. We want our privacy! Rebekah shared the example of the well-publicized Super bowl. The RA’s were going to provide snacks. She showed up early to get a good seat. Very few students showed up. While walking her corridor she noticed that students were watching the game with their group of friends in their crowded rooms. The interviewees felt they had a strong sense of community. Their meaning, however, was not what she expected. They had small, ego-centered groups which were the backbone of most college students’ social experience. She explained the type of small friend groupings in great detail. Rebekah found that student networks have less to do with personality than with shared circumstances and shared demographics. Most students that come to AnyU have already formed relationships or expectations of who they will friend. She surmised that despite the belief that college expands our social horizons and extends our experiences to include new and different types of people, the findings suggest otherwise. Students experienced contacts with the same people. About 22 – 25% of the student population at AnyU are considered “minority” by federal standards. Students shared with Rebekah that they had experienced racism. Stories consisted of rude remarks on the street, hostile looks or comments made in class. Only about 1% of white males ate with males of a different ethnicity. The number increased to about 6% when women were present. Rebekah, being an outsider herself, focuses on the International Student population at AnyU. Interviewees tell their stories complete with expectations and reality that they faced when interacting with American students. There were common themes here: American students are artificial in their friendliness. One student shared a story; the roommate comes out looking hostile and inconsiderate. Another shared that he was plainly told that he was a roommate, nothing more. But yet another was relieved that there were no obligations of courtesy or friendship in this scenario. Again, it was noted that students here were extremely independent. Some students were shocked that American students did not interact more with parents and family. International Students were shocked with our pajama wearing population. The lack of formality, eating, leaving, and interrupting (asking questions) stood out to these students. They were also surprised by the professors. The students felt that the professors here were more laid back than in their respective countries. One student likened teaching in America to a one-man show. The goal of entertainment to retain students’ attention was a new experience. Again, the impression of the ability to choose and catering to the feelings and needs of the American student was mentioned. There was great comment on the ignorance of the American student population in regards to a place other than the U.S. The International Students were amazed at the ethnocentric tendencies that were exhibited by the American student population. The best question, in my opinion, was: “Is Japan in China?” There were others. A student shared that the manner in which he ate his noodles (loudly) as was the custom in his country garnered him dirty looks from another student. Rebekah had often used an exercise in her class. It was a witch hunt – Identify the witch. She stated that invariably, the witches were always those students that paid attention, took notes, asked questions, etc. She realized that she needed to find a different way to get answers. She would write talking points and place them in women’s bathrooms and hoped to get anonymous comments. Learning is not only happening in the classroom. Some students admitted that classes and school work were a minor part of what they were learning. She polled students about how much (percentage) of their learning came from classes. The median response was that 65% of learning occurs outside of class and class-related activities. If students don’t come to school to learn, why are they there? She followed up by asking if given the chance, would they take their degree and run. Thirty-eight women responded anonymously. Eleven said they would pay for their degree and leave citing reasons such as, “I want to start my life.” Two-thirds of the sample would choose to stay in college and finish their degrees the old-fashioned way. Does the individualistic nature apply to you? Do you feel that this is an issue for our college students? If you were teaching undergrads, would you consider the ability to act as a one-man show a necessity in order to keep students engaged? What would you do if there was no participation during your lectures? Is anyone surprised by her findings? If yes, please elaborate.